President Muhammdau Buhari, National Chairman of the All Progressives Congress (APC), John Odigie-Oyegun and other top members of the party will soon know their fate as the party’s National Executive Committee (NEC) Technical Committee on Friday submitted its report on tenure of party executives. Oyegun had on Tuesday set up the panel to examine President Buhari’s position. It was reported that the committee chairman was Governor of Plateau State, Barr. Simon Lalong. 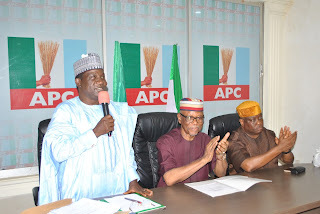 However, the APC had stated that the tenure extension controversy rocking the party will be resolved. National Publicity Secretary, Malam Bolaji Abdulahi, gave the assurance in a chat with newsmen on Wednesday. “It is left for the NEC to decide, and if the committee recommends that the position of NEC should be maintained, then there will be no need for an elective convention”, he said. “Then, the president and those who are concerned that the decision we have taken is correct or not, will have more confidence in the position of the party,’’‎ he added.